We have another new video to share our upcoming die release with you. The dies are available for Pre-Order now here at the Frantic Stamper store. Only 8 months left until Christmas! We hope you have gotten a good start on your holiday cards by playing along when we post our cards on the 25th of each month. And what better way to do that than using Frantic Stamper's very own Christmas and Holiday dies! Today we share a card from Jeni Allen. We hope you will enjoy it! I love snow globes!! When I got this globe out I knew I had to make a shaker of some sort!! 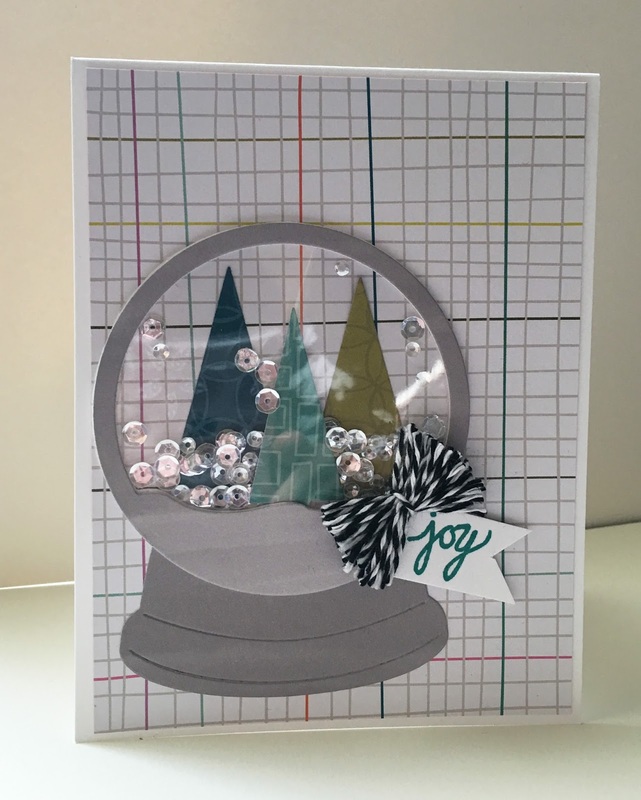 I used the beautiful Snow Globe Triangle Tree dies and cut them from some beautiful green hues...I just love these colors!! I also cut the snow globe out a few times, one of them being on some adhesive foam so I could easily add the window sheet and sequins. I love the dimension that comes with foam tape....love it!! I pulled out my twine and made a big fluffy "pom-pom-like" bow to attach my sentiment. I used the awesome joy sentiment from the stamps that match the Triangle Trees. Because of an injury to team leader Kathy Berger, we decided to ask a few of our guests from early in the year to stay on with us to make managing the team easier on Kathy. Kendra Sand has agreed to stay on as a full-time team member until the end of the year. Becky Carafa will be joining us as a full-time team member through August, and then will stay on as a guest until the end of the year. Ted Mattos will stay on with us for another month or so. We GREATLY appreciate their help in making Kathy's load a little easier. Jeni Allen has just left the team. In trying to get her family settled after a major move, she found she just didn't have time to commit to the team any more. We have loved having Jeni with us, and we will miss her when she is gone. Her work for us was fabulous, and she was always an upbeat and fun person to work with. Please join us in wishing Ted and Jeni well, and thank them for their wonderful projects, as they slowly transition off of the team. When thinking about a person to bring onboard to help fill the gap being left behind by Ted and Jeni's departures, Kathy immediately went to an online friend whose work Kathy has admired for a long time. Kathy and she have exchanged patterns and ideas for several years, and Kathy is THRILLED to be able to say that she has accepted our invitation to join the team through the end of the year. 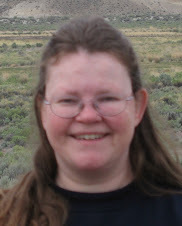 Please welcome Janine Tinklenberg, aka JanTink, to the Frantic Stamper Design Team. Here is a little about Janine her own words. We think you will soon see why Kathy considered landing Janine as part of the team a bit of a coup! Jan Tinklenberg is a happily married mother of three children who has been playing with paper as long as she can remember. Jan knew from an early age that she wanted to be an artist and discovered a passion for paper sculpture in high school. She started college, only to find that paper arts were not considered "serious art" so she changed her emphasis to watercolor instead. After having her first child, Jan discovered stamping when she was going to MOPS (Mothers of Preschoolers), and it was then that a true obsession was born. Since then, Jan spent 13 years as a Stampin' Up! demonstrator, dropping out in 2015, and she has been a member of a number of design teams including Splitcoaststampers original Dirty Dozen and their Creative Crew, as well as Flourishes LLC and Kitchen Sink Stamps, among others. Jan has been published in Paper Crafts Magazine's special Stamp It issues, has been featured in Stampin' Success magazine, and has designs published in two Annie's Attic books, Interactive Cards 1 and 2. Jan is currently serving a term as a Tombow Brand Ambassador. Besides papercrafts, Jan loves to knit, plays the organ at the Episcopal church she attends, and is a medical transcriptionist. When Kathy fell she had just started trying to get her last guest from the previous Guest Designer call set up to join the team. Unfortunately the broken elbow made typing impossible so we had to postpone her joining the team. But now Kathy's elbow is on the mend (only 6 more weeks of restricted lifting) and we are able to welcome Monica Edwards to the team. Here is a bit about Monica in her own words. My name is Monica Edwards and I am the mother two plus my big pup named Roscoe. I live in Sunny Florida home of the once infamous shuttle where I used to work. I love all things craft related and I have since I was 10 yrs old. My goal is to inspire other to create and step outside of their comfort zone. I hope to learn and grow here at the Frantic Stamper during my stay as a guest. We are very excited to see the beautiful things our newest team members will be making for us. Please give them a warm welcome! I just love these little pots and pans. They are part of the Frantic Stamper's "Mom's Kitchen" release. How fun are these??? 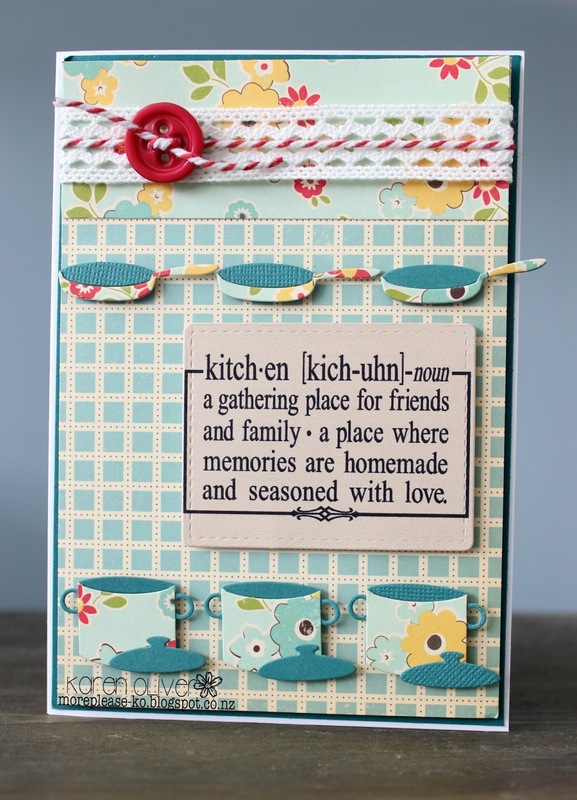 I couldn't decide on a sentiment for this card so I googled the dictionary meaning for Kitchen and found this great definition that I had to use as my sentiment. For my pots and pans I die cut them twice, once in plain card stock and once in the design paper. Using sharp pointed scissors I removed the inside part of the pots and pans from the design paper and glued this onto the card stock pieces. Its a bit more work but I think the effect is worth it and adds dimension to the die cuts. The lids of the pots are a separate little die so I placed these in front. The pots, pans and sentiment are all popped up on foam. To finish my card I added a piece of the paper I used to make the pots and pans along the top, with a strip of lace and a button tied with twine. Such a fun die set to use. We think you are going to love the new "Fishing With Dad" die and clear stamp release, coming in plenty of time for you to create the perfect card for Father's Day! Our design team members have made a bunch of gorgeous samples to showcase each of the dies in the release, and Kathy has put together a slideshow to share those cards with you. We hope you will love this release as much as we do; masculine cards are often tough for us to make, but we think this release makes creating the perfect masculine card for a fishing loving dad much easier! Be sure to visit www.franticstamper.com to see these dies (and all the other wonderful products we carry).